"I got a pair of exploding trousers this Christmas," says 12 year old Christian Pyle of Durham. "Imagine the fun when halfway through the Queen's speech the trousers ignited, my pants erupted and Granny's hat blew off." Available in three exciting sizes: "slight pop", "thunderclap" and 'blimey, what the hell was that?" 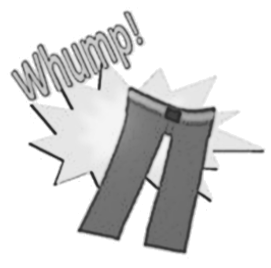 All our exploding trousers are guaranteed flameproof and are good for three hundred thrill-packed detonations. Available now from all good trouser specialists.